On the wall in Ms. Laura Ramirez’s computer science classroom at Buena Vista Horace Mann K-8, just to the right of the door, is a colorful bulletin board decorated with a dozen shapes of folded paper. Ms. Ramirez wants her students to feel comfortable failing and find ways to fiercely use problem solving skills. In her classroom, students are encouraged to be leaders, and part of becoming a leader is turning mistakes into happy accidents, like the butterfly-turned-heart. This mindset is, in turn, translated into the computer science work she teaches her students. On a recent Thursday, 14 students crouched on the floor, disassembling desktop computers, sometimes correctly and other times not knowing what a certain part is used for. The students in this particular class are the tech support for the entire school. They change toner in printers, fix projector connection issues, and understand why computer programs crash and what to do when that happens. They facilitate activities to K-1 students to teach younger students about perseverance as part of leadership training. Each student identifies as female, and most are students of color. The group is called “Tech Chicxs,” and this is their inaugural semester. To address what Ms. Ramirez observed as a lack of space for female-identifying students to learn computer science skills and take learning risks, she created the Tech Chicxs group, which started as a club but was officially designated a class this fall. 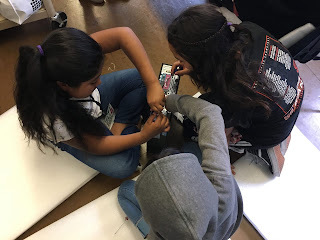 “Tech Chicas is my mechanism for addressing society’s underrepresentation of women in tech, with the purpose to empower young girls with tech tools ,” Ms. Ramirez says. “This is my attempt to address the lack of diversity in the tech industry, and break the structural barriers that perpetuate feelings of inadequacy among young girls that deter them from considering career pathways into STEM fields. Activities in the class include becoming proficient in updating and troubleshooting computers, computer programming, replace computer hardware, circuitry, develop websites for small businesses in the community, terminating cat5 cables, designing and building a battery operated car, and community partnerships with women in the tech industry, and women of color in the tech industry. Students in the class are grateful to have the time and space to learn about technology with their peers. “I used to not really like technology, but when I joined this club and learned how to do things like fix projectors, and fix browsers, I started having a lot more fun with all things tech,” 7th grade student Maria says. In 2015, the San Francisco Board of Education passed a resolution to expand computer science education to all students at all schools, making SFUSD the first large, urban school district to have a pre-K to 12th grade computer science program.